Bleached Flowers Trainers- £55- These are possibly the most beautiful trainers I've ever laid my eyes upon! I love the muted colours in the floral pattern with the contrast of the bright pink laces. Mini Dot Fabric Bow Hair Tie- £4- This vintage bow style hair tie style is really big at the moment and I think this gorgeous simple pattern would look good with a messy braid. Really inexpensive too! Hydrangea Canvas & Leather Bucket Bag- £65- This is one of the pricier picks, but I just love the shape of this bag and the neutral colours. I think this shape of bag is great for every day as you could easily fit all the essentials in there. Set of 3 Fragranced Candles- £18- These would make a great gift for a homeware lover! The scents are Lavender, Fresh Linen and Peony. You could also keep the pots when you've finished with the candles and they'd be great for storing little bits and pieces on your dressing table. Spray Flowers Card Wallet with Zip Purse- £38- I love Cath Kidston purses, they do so many different shapes, sizes and variations that are all so practical. This spray flowers design is so classy and there are so many card slots. That's it for now, although I could definitely go on! What do you think of my picks? 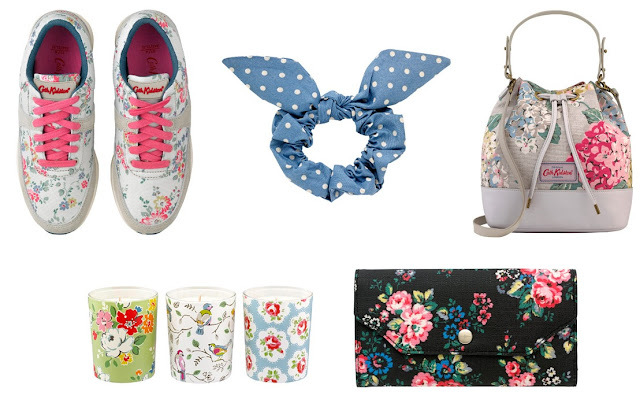 What Cath Kidston items do you have your eye on?